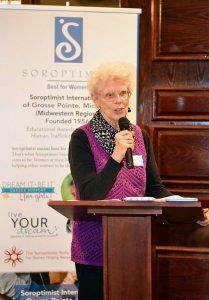 April 9, 2019, Eastpointe, Michigan – Sister Theresa Mayrand, OP, received the Ruby Award from Soroptimist International-Grosse Pointe during a banquet March 13 at the Assumption Greek Orthodox Church in St. Clair Shoes, Michigan. The award – which “acknowledges a woman who has made a significant difference improving the lives of women and girls” – includes a check for $500 for the organization in which the recipient works. Sister Theresa received the award for her years of ministry at Gianna House in Detroit, which offers services and support to teenage and young pregnant women and mothers. The Associate Director of Gianna House, Sister Theresa has developed and now operates the outreach program. Recently, Gianna House received the license to also function as a residence for up to 15 people – young teenagers or teen mothers ages 13 to 17 with their infants – and is expecting the first resident to move in soon. Sister Theresa was nominated for the award by Carol Hofer, an Adrian Dominican Associate and member of Soroptimist International-Grosse Pointe. “The whole spirit of the Soroptimists involves women helping women,” Sister Theresa said. After receiving her award, she gave a presentation on the work of Gianna House, which was established at the convent of St. Veronica Parish in Detroit in 2013. Gianna House offers core classes – considered the most important for the development of the mothers – such as prenatal and infant care, labor and birthing, parenting, personal growth, and spiritual journey. The women can also take a variety of enrichment classes, from sewing, scrapbooking, and crocheting to yoga and jewelry making. As the women attend classes, they earn “baby bucks” which are redeemed for items offered in the Gianna House store: diapers, wipes, baby and mom toiletries, and other items donated by the public. Attending the classes also gives the women a sense of community. “Mainly what the women like is being with other women,” Sister Theresa said. “Sometimes it’s good for them to have somebody to listen to them. We greet them with a hug when they come. They feel warmly welcomed.” For many women, time at Gianna House with other pregnant women or mothers is “me time,” Sister Theresa said. Gianna House also garners much support and collaboration from the local community, especially in Macomb County, Sister Theresa said. During the first year, the county’s public health nurses gave presentations on topics such as sleep, car seat safety, breast feeding, and lead poisoning. Members of the behavioral office at the Michigan State University Extension Office offered a series of classes on stress management, anger management, and nutrition. Sister Theresa said Gianna House has also received support from Knights of Columbus Councils and local parishes, who often host fundraisers. “Usually it’s the parish women’s group that will throw a shower for us and ask what we need,” she said. One member of a local parish women’s group was very active, often bringing a casserole to baby showers and volunteering at Gianna House. After she died of cancer, the women’s group in her parish organized a spaghetti dinner to raise funds for Gianna House in her memory. 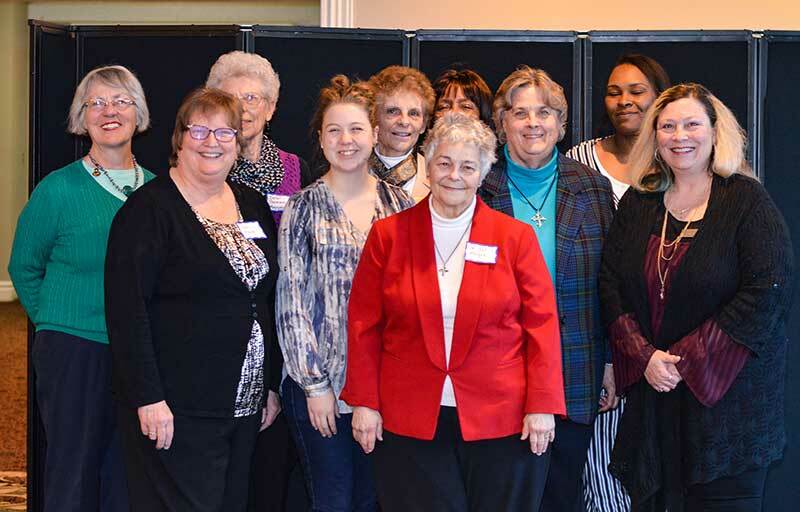 Gianna House has also receives support from the Adrian Dominican Sisters and Associates in the Detroit area, many of whom bring baby toiletries to the Fall Assembly of the Congregation’s Great Lakes Dominican Mission Chapter, based in Detroit. Sister Carol Weber, OP, Co-founder and Co-director of St. Luke N.E.W. Life Center in Flint, Michigan, donated sewing machines and fabric from her organization’s commercial sewing venture. One Sister volunteers as a receptionist every Monday, while others come to Gianna House to help with mailings. Still, Sister Theresa derives a sense of satisfaction from her ministry at Gianna House. “What gives me a lot of joy is to know that we are helping women in ways that they need or appreciate – whether it’s a sense of community, whether it’s knowledge, or whether we’re giving them time for themselves,” she said.